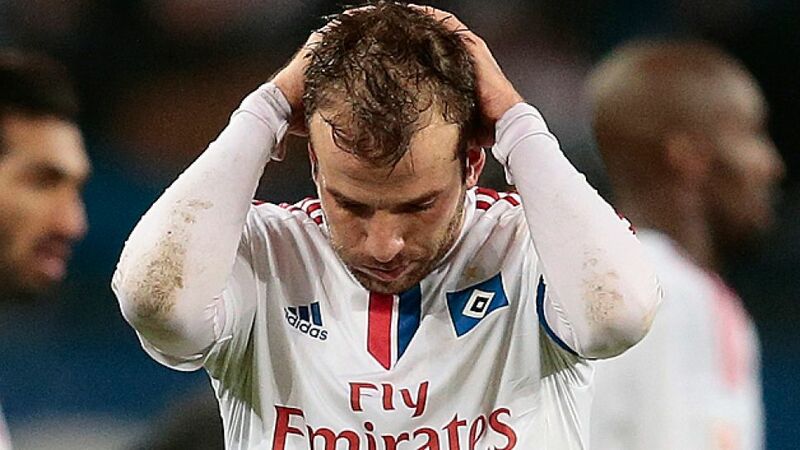 Rafael Van der Vaart felt Hamburg's defeat at home to Stuttgart was "unbelievable"
Hamburg - VfB Stuttgart won the relegation six-pointer at the Imtech Arena to close the gap on Hamburger SV, whose captain Rafael van der Vaart could not quite come to terms with what exactly happened. Rafael van der Vaart: "We began well, but then we started misplacing too many passes, conceded a goal and just fell apart. It's unbelievable! We tried everything we could and it's not like we didn't have any chances. That can't happen. In the build-up to the goal I wanted to play a long ball which I underhit a little, that sort of thing happens in football. It was a bad day for us, but we have to go into our next game at Schalke in a positive manner. It's unbelievable." Johan Djourou: "We started off really well, but we just didn't manage to create enough chances. Then we conceded an unfortunate goal on the counter-attack. We should have done better playing with a one-man advantage in the second half. Of course Stuttgart defended deep, but overall we didn't create enough chances." Dennis Diekmeier: "We controlled the game in the first half but then, for whatever reason, we stopped playing football. We fought hard and managed to win our challenges, but that final ball was missing. All Stuttgart were doing at the end was hoofing the ball up field." Florian Klein: "Of course we're absolutely delighted with the win, and I think we fully deserved it too. We defended really well and were able to get at them repeatedly in the first half. With a man less, we had to really fight, but we still didn't let them have many chances." Christian Gentner: "Our organisation out there on the field was spot on. We defended really well and fought hard. These three points do us good because we've managed to close a gap to a rival in the relegation battle." Georg Niedermeier: "It was important to keep things tight and try to attack with a compact, organised defence. I don't know if it was really a clear goalscoring opportunity for my read card because Go [Sakai] was nearby and he could have recovered. But the team fought passionately with a man down and deserved the win."